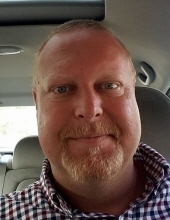 PERRY, Steven M. - age 42, of Swartz Creek, died September 3, 2018. Funeral service will be held 11 AM Thursday, September 6, 2018 at Sharp Funeral Home & Cremation Center, 6063 Fenton Rd., Flint. Interment will follow at Flint Memorial Park. Visitation will be held 4-8 PM Wednesday at the funeral home. In lieu of flowers, contributions may be made to the Steven M. Perry memorial fund. Steven was born May 24, 1976 in Flint. He was a truck driver and a truck driver instructor. Surviving are: two sons, Alexander and Steven Perry; mother, Sharon (Jim) Kelley; five stepbrothers; one step-sister; grandmother, Mary Gould; special friend, Paula Williams. He was preceded in death by: his father, Alan Perry; and his grandparents, Arlene and Vincent Perry. Tributes may be share at www.sharpfuneralhomes.com. To send flowers or a remembrance gift to the family of Steven M. Perry, please visit our Tribute Store. "Email Address" would like to share the life celebration of Steven M. Perry. Click on the "link" to go to share a favorite memory or leave a condolence message for the family.